Some of Britain’s favourite and best known TV stars and celebrities have backed this year’s NHS winter campaign. Stay Well This Winter – a joint initiative between NHS England and Public Health England – drives home key messages to the public which it is hoped will help take the pressure off frontline services. 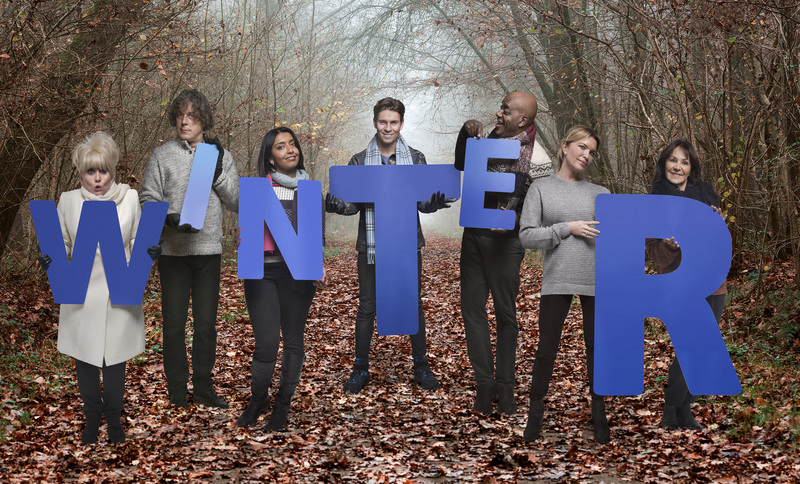 Alan Davies, Joey Essex, Ainsley Harriott, Tina Hobley, Arlene Phillips, Sunetra Sarker and Barbara Windsor have all pledge their support for the drive to help people Stay Well over the coming winter months. And TV doctor Rosemary Leonard is also backing the campaign while reminding people to keep a watchful eye on elderly neighbours and relatives. Among its important messages, the campaign urges people to stay warm and visit their pharmacist at the first sign of a cough or cold, while also making sure they get their flu jab to help ward off even worse illness. Actress Barbara Windsor, who starred in Carry On Doctor and was the matriarch of the Queen Vic in BBC soap EastEnders, said: “It’s the simplest things that we sometimes forget, and when remembered, they can make all the difference! “The Stay Well This Winter campaign is a great way of reminding people about the little things they can do to make sure they’re protecting themselves as the cold weather sets in, whether that’s staying warm, stocking up on prescription medicines or checking in on friends and neighbours to make sure they are keeping well”. Celebrity chef Ainsley Harriott added: “We’re all more prone to illness in the colder months, and we all know that certain people, like the elderly and those with long-term health conditions, are more at risk than the rest of us. I think people sometimes forget about simple things that we can do to prepare for winter, which can make all the difference! It’s so easy, for instance, to stock up your cupboards with plenty of wholesome and healthy foods like tinned fruit, veg, fish and meat – which can go a long way to ensuring you’re well-nourished on days when it’s too cold and icy to head to the shops. Tina Hobley, star of TV hospital drama Holby City and Coronation Street, said: “The Stay Well This Winter campaign is about protecting yourself, your family and the people around you in the colder months. The boost to the winter campaign coincides with Self Care Week which starts today and has many similar messages to people, especially those with long term conditions. The celebrities came together to be photographed in their woollies holding the letters W-I-N-T-E-R. Each letter represents an action people and their families can take to ensure they stay well over the winter months. The latest figures show that that excess winter deaths contribute to about one in 20 of all deaths a year, with older people who may be frail, or who have existing long term health conditions, most at risk. TV doctor Dr. Rosemary Leonard said she wants to encourage the public to be more aware of the dangers that winter can bring, adding: “Elderly people and those with long term health conditions are particularly vulnerable to winter illnesses so I’d urge anyone that falls into these groups to take heed of these messages and plan ahead for winter. The launch of these iconic images coincides with the start of Self Care week which aims to help people understand when it is safe to look after their own health, when to seek treatment, and where to access health advice, whether it is from the pharmacist, GP, nurse or if emergency treatment is required. Arlene Phillips, choreographer and former judge on Strictly Come Dancing, said: “The campaign is all about looking after not only yourself, but also the people around you in the winter time. Having taken care of my elderly father as he lived with dementia, I am fully aware of just how dangerous the winter can be, particularly for the people who are most vulnerable, like the elderly and those with long-term health conditions. Sunetra Sarker, actress in hospital TV drama Casualty, said: “I’m very aware of how the winter can affect people’s health and we all need to look after older members of our family this winter. I want to make sure I know all the things I can do to look out for my loved ones, and I’m sure other people are in the same position as me. Alan Davies, comedian and actor in Jonathan Creek, added: “My priority, like all parents, is to make sure my children are happy and healthy, indeed, nobody wants to see their children ill, particularly when there are things we can do to prevent it. NHS England’s National Medical Director, Professor Sir Bruce Keogh, said: “Through TV, radio, posters and leaflets we will help people know where to seek help and get advice – whether it’s pharmacies, NHS Choices, calling 111 or A&E. “It’s critical we all do what we can help others stay well this winter. Think of the elderly. Half live alone and one third only occasionally socialise if at all, so they are slow to seek help. Those who are frail can get very sick very quickly – even a cold can end up with a stay in hospital. John Smith, Chief Executive of PAGB, which organises Self Care Week on behalf of the Self Care Forum, said: “It is important we support people to look after their own and their family’s health, particularly over the winter. “There are still misconceptions about the self-treatable conditions we all experience, such as coughs, colds and sore throats. For example, more than a third of people who go to see their GP with cold or flu symptoms do so to get a prescription for antibiotics, even though we know that antibiotics just don’t work on these viruses.